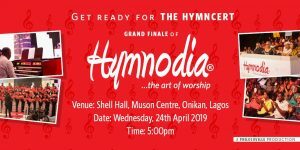 After several weeks of singing, intrigues, drama, learning and fun, Hymnodia – the art of worship comes to its grand finale on Wednesday, April 24, 2019 at the Shell Hall of MUSON Centre, Lagos. Hymnodia is a triple-E (entertainment, edification and education) reality platform created around the hymns in worship. Hymnodia is designed to reignite the hymn and worship culture; and focus people on the almost forgotten art and value of hymn writing and singing. Who will win the ASAPH plus N5m and a brand new car? Be in hall and enjoy endless hymn renditions from frontline choirs, soloists, instrumentalists and your favourite Hymntestants.